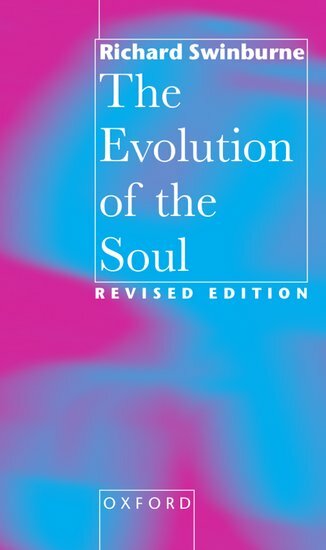 The Evolution of the Soul, rev. ed. This thoroughly revised and expanded edition of Swinburne’s classic of philosophy has reinforced and revised his argument for a philosophical defense of substance dualism. Aware of the deeply "unfashionable" nature of his thought Swinburne’s carefully constructed arguments range across a host of varied fields and modern insights in order to move beyond and refine Cartesian dualism. Swinburne firstly argues that the human subject cannot be considered as a merely a physical thing as pure mental events (the experience of pain) are clearly distinct from physical events (in this case the C-fibres in the brain firing.) For Swinburne the most basic components of the mental life are sensations, thoughts, purposing, desires, and beliefs, none of which is reducible to or adequately explained as solely physical events. Secondly, through a variety of thought experiments, Swinburne goes on to claim that humans (and the "higher" or more evolved animals) consist of two separate and distinct parts the soul and the body. Physical events are described as goings-on in the body, whereas (pure) mental events are goings-on in the soul. These two states are said to interact as Swinburne claims that whilst the body is an ordinary material object, it is connected to a soul, ‘which is the essential part of a man.’ Finally, the third part of Swinburne’s argument goes on to describe the capacities, properties and structures of the human soul, claiming that this also includes free will – the choosing to do so, or act in a certain way without choice being predetermined by priors states or affairs. Following this, the book concludes with a variety of appendices, as Professor Swinburne responds to various criticism of his arguments and amplifies his own points whilst commenting on more recent work in philosophy on the mind body problem. Whilst the book is carefully argued and constructed there is an element which some may find unconvincing. On the notion of interactionism, how a non-material substance (the soul) can influence a physical one (the body) Swinburne argues that even though we cannot explain how this happens, we should not pretend that it does not occur. At the very least, it seems reasonable for Swinburne to explain why this is inexplicable over simply asserting that this is the case. Despite some minor criticisms in terms of argumentation, Swinburne mounts an incredible thorough and well-reasoned defense of the idea of substance dualism that manages to be an excellent introduction to the complex and fascinating philosophical field of the mind/body problem.